After the disintegration of the USSR, Ukraine found itself in possession of the world's third largest nuclear arsenal. There were 176 launchers of intercontinental ballistic missiles with some 1,240 warheads on Ukrainian territory. This force consisted of 130 SS-19s, each capable of delivering six nuclear weapons, and 46 SS-24s, each armed with ten nuclear weapons. An additional 14 SS-24 missiles were present in Ukraine, but not operationally deployed with warheads. Several dozen bombers with strategic nuclear capabilities were armed with some 600 air-launched missiles, along with gravity bombs. In addition, as many as 3,000 tactical nuclear weapons rounded out an arsenal totalling approximately 5,000 strategic and tactical weapons. From the first days of its independent development, Ukraine affirmed three basic principles -- not to accept, manufacture or acquire nuclear weapons. The West remained concerned with the nuclear aspects of Ukraine's problems with weapons proliferation. Western sensitivity over nuclear issues convinced Ukraine's leaders that they could influence the West by using the nuclear lever. The Declaration on State Sovereignty adopted by the Parliament of the Ukrainian SSR on 16 July 1990 defined the building of the army as a major task and a natural right of the future Ukrainian independent state. By announcing the right to maintain its own army, Ukraine took a significant step toward independence from the USSR. The military coup in Moscow in August 1991 and fears that Soviet troops on Ukraine's territory would act aggressively against the Ukrainian state led the official leadership in Kiev to subordinate these troops to the control of Ukrainian authorities. Ukraine also announced as its own the Soviet military property on the soil of the newly independent state. Ukraine inherited about 30 percent of the Soviet military industry, which included between 50 and 60 percent of all Ukrainian enterprises, employing 40 percent of its working population. Ukraine was, and remains, the leader in missile-related technology, especially guidance systems, navigation electronics for combat vessels and submarines, and radar for military jets. Strong competition in the world's weapons market forced Ukraine to look into exporting arms to politically unstable or even aggressive regimes. Ukraine established its own network for arms export and, in so doing, did not fully recognize international rules and bans. The Ukrainian military traded conventional arms on the black market and signed contracts with commercial firms. The first contracts on weapons deliveries to Iran, signed in the middle of 1992, and caused negative reaction in the West (particularly in the US). Ukraine has a sufficient amount of highly enriched uranium, which the United States wanted to buy from the Kharkiv Institute of Physics and Technology. Ukraine also has two uranium mining and processing factories, a heavy water plant, a technology for making electronic to determine the isotopic composition of fissionable materials. Ukraine has deposits of uranium that are among the world's richest. Originally Ukrainian leader Leonid Kravchuk was "not worried" if nuclear weapons went to Russia for decommissioning. 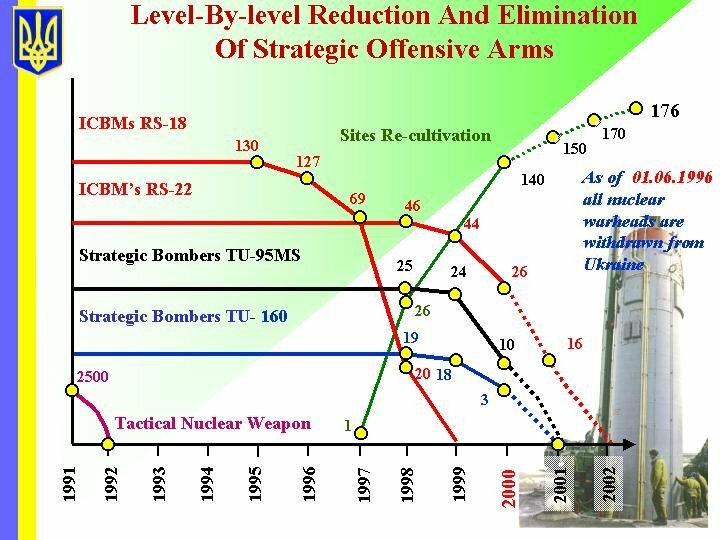 Gradually, however, his worries developed sufficiently to lead to him to reverse his position and on 12 March 1992 to suspend temporarily the transfer of tactical nuclear weapons to Russia. However, in conformity with the 16 July 1990 "Declaration of State Sovereignty" and other agreements signed at the creation of the CIS, by May 1992 Ukraine voluntarily removed all tactical nuclear weapons [approximately 3000] inherited from the former Soviet Union. 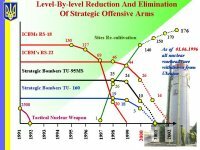 The Strategic Nuclear Arms Elimination in Ukraine - SNAE (U) program in Ukraine was structured to support Ukrainian participation in START I Treaty implementation and facilitate the destruction of WMD delivery systems. The U.S. Department of Energy's International Nuclear Export Control Program [INECP] provides support to the State Department's Export Control and Border Security Program's (EXBS) nonproliferation goals by focusing resources on cooperative projects in the three themes that guide its domestic program: licensing, industry outreach, and enforcement. In Ukraine, INECP provided support to licensing activities for both of the country's premier nuclear institutes-the Institute for Nuclear Research (INR) and the Kharkiv Institute of Physics and Technology (KIPT). Support for the Nuclear Export License Review System (NELRS), a computer-based system designed to facilitate the technical review of license applications, is ongoing. A second automated system, the SSECU departmental database, was also developed with INECP support. This database is used by the Nuclear Item Review Department of SSECU to review past licenses and access reference materials. In Industry Outreach, American experts joined with representatives of INR and KIPT, as well as Ukraine's State Service for Export Control and the Science and Technology Center (STC) in providing presentations on technology transfers and technology security, commodity classification, and internal compliance for the nuclear industry in Ukraine . In the area of enforcement, the George Kuzmycz Training Center completed the first step of developing a training course for the State Customs Service of Ukraine (SCSU) by completing a curriculum deliverable accepted by SCSU. The Kuzmycz Center, it was agreed, will develop the training courses and begin training SCSU in FY 2003.